For the New Zealand range of hills, see Lammermoor Range. 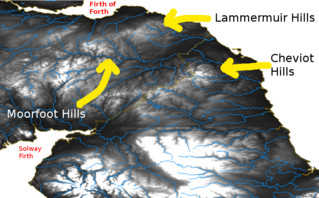 Relief map showing the Lammermuir, Moorfoot, and Cheviot Hills. The Lammermuirs (An Lomair Mòr in Gaelic) are a range of hills in southern Scotland, forming a natural boundary between Lothian and the Borders. It could be that the name literally means "lambs' moor". and is derived from the Old English words lambra and mor. It could also be the case that the name is Gaelic, and derived from lann barra mor, meaning "level spot on the big height". Early forms include Lombormore, Lambremore, Lambermora and Lambirmor. Spanning the counties of Selkirk, East Lothian, and Berwick, the Lammermuirs extend from the Gala Water to St Abb's Head, and offer a traditional site for sheep grazing. The hills are nowhere especially high, the highest points being Meikle Says Law at 535 m (1,755 ft) and the Lammer Law at 528 m (1,732 ft); but steep gradients, exposure to the elements, and a lack of natural passes combine to form a formidable barrier to communications between Edinburgh and the Borders. The hills are crossed by only one major road (the A68), which crosses the shoulder of Soutra Hill between Lauder and Pathhead, and is frequently closed by snow in winter. The main road linking Edinburgh to England (the A1) avoids the hills by following a circuitous route around the coast. White Castle was an Iron Age hill fort, settled by the ancestors of the Votadini tribe. Crystal Rig Wind Farm is located on the hills. The Northumbrian missionary bishop Cuthbert spent his early years as a shepherd on the Lammermuir Hills. Sir Walter Scott's novel The Bride of Lammermoor and Donizetti's derivative Lucia di Lammermoor is set here. Scott lived at Abbotsford House, near Galashiels. Two ranges of hills in New Zealand, the Lammermoors and Lammerlaws are named after the Scottish hills. ^ a b c Johnston, James B (1892). Place-names of Scotland. Edinburgh, Scotland: D Douglas. p. 162. Retrieved 4 February 2019. This page was last edited on 27 March 2019, at 22:20 (UTC).